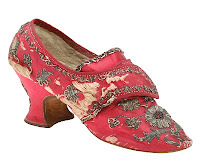 18th c. Shoes: Why Silk Fabric and not Leather? The majority of you voted for a fabric shoe. In the 18th c. shoes survey I asked you all to take a little while ago, 64% of you requested a shoe made from fabric, while 30% wished for smooth leather. While the majority of the 64% wanted a light-colored fabric, I decided to accommodate everyone by making the shoe fabric dyable to any color, including black. Fabric shoes are historically accurate. "For most of the 18th century, leather was reserved for boots, while silk, wool and linen formed the principle fabrics for women's footwear." It was not until the 1780s that leather began to be used for women's shoes, and this was due to improved dye technologies that allowed ladies' shoes to be more exciting colors than black. 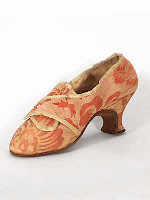 In all my research, looking through hundreds of museum images, I only found one single pair of 1750s-80s women's shoes that were constructed of leather. This, of course, only pertains to shoes of the upper middle class, the gentry, the aristocracy, and royalty. Working women likely had little use for pretty silk shoes. Fabric shoes are most appropriate for fancy clothes. Another reason for choosing a silk shoe over leather is that they are appropriate to wear with your fancy clothing. This ties in with the historical accuracy - women of the upper classes did not want to wear the same footwear as those of the working classes. While leather is practical, it's not particularly pretty (at least not until the 1780s.) Just as you will note that wearing delicate silk shoes to your re-enactment camps is highly impractical, it is equally as inappropriate to wear your black leather working woman's shoes with your silk robe a l'Anglaise, or the taffeta robe a la Francaise you spent a year sewing. Giving you a choice in period footwear. When the idea to make 18th c. shoes first dawned on me, I went on a quest to find any other companies that offered the kind of historically accurate, pretty, and versatile footwear that I myself wanted. I was tired and annoyed at having no other affordable choice besides black leather, and no affordable choice at all in fabric. I find that in many eras of costume we can get away with wearing "sortof" shoes. Most of the time they're not seen, right? Unfortunately for 18th c. dress, your shoes are almost always seen, particularly if wearing walking length skirts, and there are no "almost" shoes (believe me, I've looked!). Shoes in the 18th c., for ladies of rank, were just as important as any other part of the costume. They were jewels to be loved and admired. They were meant to be seen. With all the other work put into a costume, getting the hats and gloves and petticoats and wigs and makeup perfect, why then be forced to wear basic, boring, inappropriate shoes? I do also understand, however, that while most of you will love to have fabric shoes for special occasions, there is also a great need for well-designed and comfortable leather shoes as well. Depending on the success of the first release (silk), I WILL be then releasing the same design in leather, which will come with all the same ability to be customized as you like, but hard-wearing for stomping through fields and dirt roads. However, do not forgo the silk shoes and wait for the leather! If we do not sell enough pretty silk shoes, I will not be able to put the order through, and there will be no shoes for anybody! As always, your comments, input, and suggestions are welcome. Because of your wonderful input, I have made changes to the design to make the shoes more historically accurate (no velcro anywhere! ), and with the proper shaped Louie heel. Keep talking, and together we'll make a truly beautiful line of shoes! Looking forward to these! What color silk did you pick, just a white or off-white? I think that dyeable silk shoes will be perfect! If they only came in black leather, I'd maybe buy one pair. Maybe. (Like you said, black is practical but BORING!) Being able to customize them means that I need to save my pennies for at least a couple pairs! Color - they are pure white. I went with pure white because they will work as wedding shoes with pure white gowns, and also whatever color you decide to dye them will be uncorrupted by any existing pigment already in the fabric. Think of the white shoes as "blanks" and decorate away! Rowenna, you're right, those were my thoughts exactly. I have "rough" suede shoes and they just look too casual for most of the costumes I make, and don't work with the light-colored gowns, like baby pink or seafoam green. Brocades - possibility in the future, if I can find a brocade that can also be dyed. The ability to make them 100% unique and completely your own is very important to me. I've just found your blog and am so excited about these shoes! Have to see if there's room in the budget to order a pair (or two!). Do you think that you are going to be able to ship outisde the USA? Yes, of course! I can ship anywhere in the world! Ah, good to hear! It's so hard to find nice 18th century shoes. Now my hope is you, or I will have to wear this pair: http://www.brandos.se/clarks/ripple-vale-20340869-black-suede/a17778 for my first event. They are really cute, but not very historical accurate. Oo, those are really cute! They are surprisingly accurate for 1915-30ish, but you're right, the laces were not so much an 18th c. thing. You could hide them with big fluffy bows, though! When is your first event? We're looking at Mid-April to May to get the shoes here and shipped out to you, so you might want to go ahead and get your back-up pair. I've got the back-ups already. I fell inlove with them and asked my parents to buy the pair as a christmas gift. They did and now they are my back-ups. I can't wait to see them! Fabric is nice, or leather - I'm just excited that they will have leather linings and soles (so important for comfort!). The problem with the shoes coming in white is that I am going to be struck with decision paralysis about what colours to dye them! Aimee, no troubles there, because everyone let me know the need for larger sizes, I'm ordering 11s, 11.5s, and 12s. Dreamstress - well, I can't say I feel sorry for you, hahaha! I look very much forward to nice silk shoes - leather is available elsewhere, but silk isn't. About embroidery and brocade - me, I would cut out the motifs and applique them onto the shoes :) Good as a bought one! I'm so excited that someone is finally producing silk shoes from this era (and for prices that won't break the bank)! 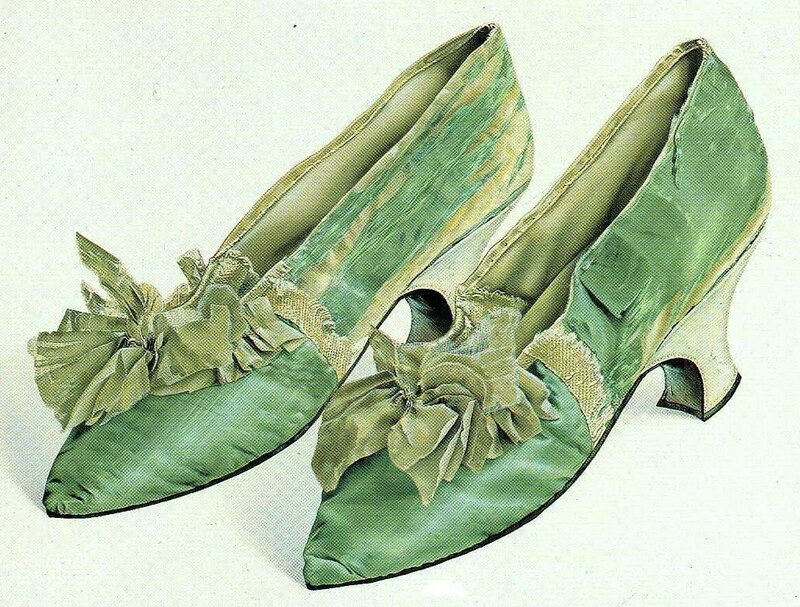 My wedding in June will be 18th century-themed, and I would love to wear authentic shoes with my 1780s style gown. I had just about resigned myself to buying modern bridal shoes when I came across your blog. Can't wait to see how they turn out!